Do your homework, assess the hurdles and experiment. Many business thinkers are discussing the ways that companies need to become more agile. Organizations need to have the ability to quickly prototype, test and refine not only new products but completely new strategies. This necessitates a new approach to deploying talent, one which the 2015 study by Randstad US Workforce 2025 called the agile workforce model. Randstad defined this idea as “the strategic ability to meet talent needs through the real-time use of contract, temporary, consulting or freelance workers”. Researchers also discovered that this practice grew 155% between 2014 and 2016. This idea is being endorsed by leading companies. For example, GE has launched GeniusLink, a crowdsourced expertise platform that serves up challenges to the knowledge market with the goal of developing novel solutions. One such challenge is developing new nut assemblies for aviation engines to mitigate failures. These critical projects historically would have been done by in-house R&D teams, but no more. Or, consider the Hyperloop, a proposed mode of passenger and freight transportation where a sealed pod travels at high speeds through a tube. Various efforts are being pursued, one of which – Hyperloop Transportation Technologies (HTT) – now has 800 people working on their version of the innovative new transit system. There are 40 partnerships with universities, 50 teams on six continents, and only 12 regular employees. HTT may be the epitome of the agile organization, where workers combine for one-week sprints, complete their work and move on. 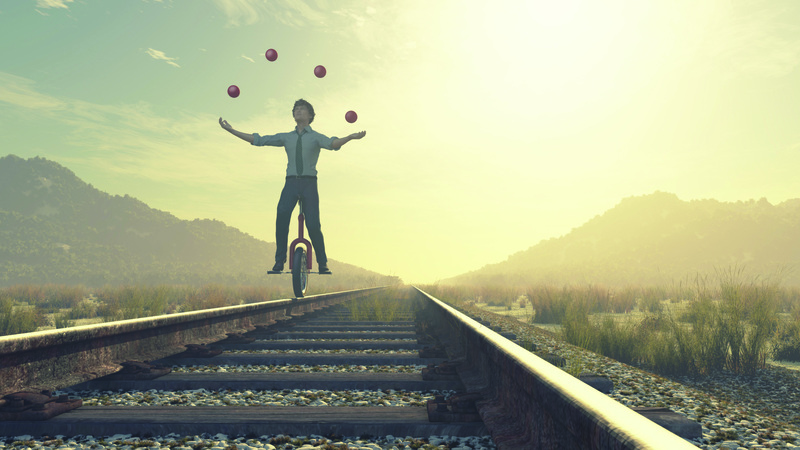 Too many companies don’t yet ‘get it’ and view the agile workforce as just another spin on the contingent workforce, contractors and temporary workers that large firms have historically controlled through vendor management systems (VMS). The VMS, typically controlled by procurement, helped rein in spending on these outside services, slotting them into understandable categories of staff augmentation or statement of work (SOW) projects. In some cases, knowledge work that failed to fit neatly into one of those slots would create issues for the hiring managers. In many organizations, the needs of the unit would win out, resulting in ‘rogue spending’, where managers would sidestep the VMS system, and finagle a way to procure the requisite talent outside the confines of the VMS structure. As more and more specialized talent needs are emerging, companies are realizing that the VMS model is not meeting its requirements, since it increases the time it takes to bring in the talent, and it is highly transactional, focused on the cost of specific labour for specific outcomes. In the new world of work, cross-functional teams of knowledge workers need to come together quickly to launch projects that may have uncertain outcomes. Teams need to ‘scale up’ with external skills, or ‘skill up’ by adding the expertise needed to round out the team. As Sandra Pinnavaia, chief knowledge and innovation officer of Business Talent Group (BTG), says: “There is a difference between task-based outsourcing and business-problem insourcing.” The lines are now blurring between contingent labour and consulting. According to Upwork, one of the largest digital talent platforms, in 2017, major Fortune 500 company clients were wrestling with this issue and viewing it as a change management problem: how do they get the organization to adapt to a new talent model? This year, the discussion is dramatically different, reports Zoe Harte, senior vice president of human resources and talent innovation at Upwork. Now the conversation is about how to create agile talent-pilots within the organization, which can then be replicated at scale. If your organization is not wrestling with this question, it risks being at a disadvantage in the marketplace. How can you jumpstart your efforts? Here are three key steps. Despite the fact that independent talent has been thriving at the professional level for decades, it is surprising that many in the senior management ranks have no idea of the breadth of expertise that is available on a just-in-time basis. Many still just think of the ‘gig economy’ as those drivers for Uber and Lyft, and fail to recognize the many levels of skills that can be found in the independent work marketplace. 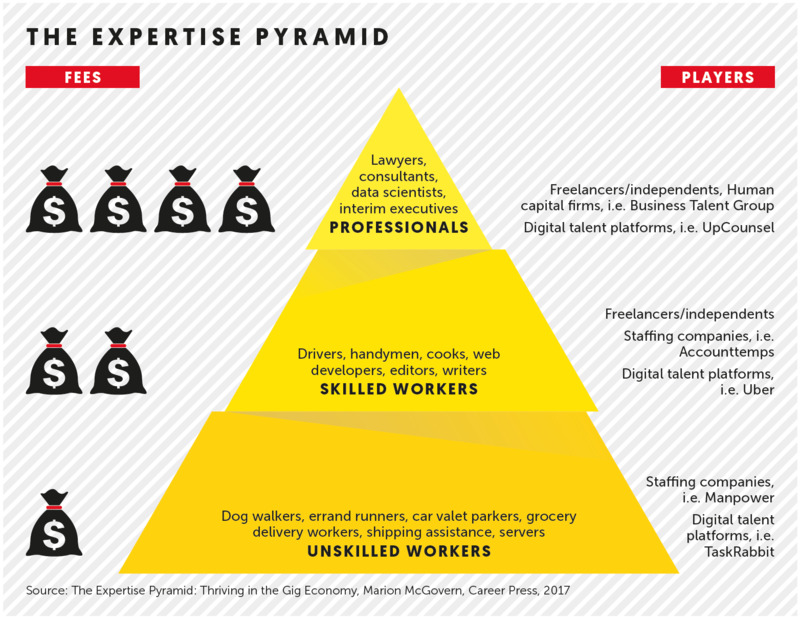 There is a pyramid structure to the workplace, where commoditized on-demand services make up the base, while skilled workers across various disciplines populate the middle tier, and credentialled professionals operate at the highest levels. These highly educated, highly specialized independent workers were dubbed by Deloitte as ‘off-balance-sheet workers’, and they represent a cohort that is increasingly in demand. The independent expertise market is only becoming more robust. The Gerson Lehrman Group (GLG), one of the first expert marketplaces, believes the expert end of the gig marketplace will reach $1 billion in revenues by 2022 (The Rise of the Expert Economy, Civic Research 2018). There are many different types of players who offer a variety of service levels. Zintro, for example, allows clients to contract with an expert for a project for just a 30-minute phone call. Platform companies, like Spare Hire, allow clients to specify a particular project with a self-service model. Specialist firms like BTG handle the vetting for you, providing clients with various screened professionals for any given project. Additionally, there are specialist firms like Experfy, which is a platform for data scientists, or Life Science Hub Wales, a site for consultants involved in drug discovery and clinical trials. This marketplace allows companies to bring in talent on a just-in-time basis. But, there can be hindrances. The starting point is to work out who looks after this relationship: is it HR, the line manager, the C-suite or procurement? Is it a strategic asset carefully managed, a service that is curated or a cost that is controlled? Your attitude here will affect how attractive you are as an employer of just-in-time talent. MBO Partners, a firm that helps companies easily engage independent contractors, recently published its 2018 Client of Choice Report. The study notes that 96% of senior independent workers viewed having an efficient onboarding and contracting process was a key point in choosing the client. Take note, in 46% of the situations, the talent is choosing with whom they work. In another 36%, the talent has some input, so companies only have complete leverage with top independent talent 18% of the time. In his 2015 book, Lead the Work, John Boudreau and his co-authors argue that “leading the work means creating engagement with your culture among a workforce that exists beyond your boundaries”. This has a few implications. First, firms must realize that they are creating the freelance talent of the future. The future of work is likely to become portfolio-like, where workers will work for an enterprise, gain skills, move on and freelance, and then potentially take another employed position. Along the way, as they build more skills, they may return on a consulting basis to some of their prior employers. Your company should want to be in that cohort. Given this, some of the time-honoured HR functions are not appropriate for a structure where talent is highly mobile. Just as there are processes for hiring and separation, there may need to be some for rejoining, whether as an employee or a contractor. Existing talent acquisition structures can be problematic. HR is very involved in the hiring of key employee talent but often uninvolved in the vetting of senior freelance talent, some of which may come through the VMS. Many would argue they do not have the bandwidth to vet freelancers. Since a great deal of independent work is sourced based on a project specification, this creates additional tension for HR, since HR is often highly tied to job descriptions. As the world of work becomes more projectized, the role of job descriptions needs to change. Kristen McAlister, president of Cerius Executives, a specialist talent provider, likens job descriptions to the proverbial junk drawer. People just keep throwing things in it, so after a while there is no sense of the real content. The truth of the matter is that job descriptions are irrelevant. Finally, organizational biases can hinder adoption. The Oxford study listed overcoming internal resistance as a key obstacle. Line managers may see new, innovative approaches as C-suite rhetoric and view such ideas with skepticism. Alternatively, some people only trust those who have risen through the ranks of the organization, not recognizing the value of that outside perspective. Others often dismiss independent workers as people who couldn’t get “a real job”, thereby discounting not just the functional skills but the entrepreneurial skills of independent talent as well. This is most harmful for those freelancers who work as part of internal teams. The research on high performance teams at Google has stressed the primacy of psychological safety. To have that safety, team members must be viewed as peers, so any caste structure imposed on freelancers would impair the efficiency of the team. In a recent Upwork study, The Future Workforce Report, hiring managers expected the use of flexible workers to increase 168% in the next 10 years. The Freelancing in America: 2017 study, a joint project of Upwork and Freelancers Union, reported that half of all freelancers would not take a regular job regardless of how much compensation was offered. Unlike smaller firms, very few large companies have an enterprise-wide model for bringing in independent talent effectively. The ones who are leading the pack are those who recognize that this world of talent needs to be approached differently, so they are experimenting with pilot programmes to build a new approach. The Oxford Internet Institute, in its study of Fortune 500 firms in 2017, recommends having a “safe environment” for trying the approach – safe meaning that failures could occur and would be viewed as learning experiences for the organization, rather than blemishes for the project team leaders. Here are some of the observations of successful pilot initiatives from both industry experts and talent intermediaries. Being able to point to the ROI of an approach is a powerful way to give it proof points. The Oxford report points to a Samsung pilot programme where 15 project managers were asked to source ten projects each. That pilot programme had real data on outcomes. Projects which have rhythms that are determined by outside forces are prime candidates for spot expertise. For example, a drug commercialization project for a BTG client called for several experts to assist with global licensing. In many jurisdictions, the process involved a lot of waiting, so there was a natural ebb and flow to the project. The talent ebbed as well, working only when it needed to. Certain expertise needs are episodic. Being able to call upon the same resource six months later for a similar need – and quickly deploy that individual – is a competitive asset. For example, on M&A due diligence, a team of internal and external experts would assemble as a deal was reviewed, disband when the work was completed, and reconvene when the next deal came to the fore. Some firms create a bench of on-call experts to manage capacity variability. An executive champion is critical. To the extent that creating a new talent model is a strategic move, it needs to have C-suite support. Along the way there can be legal issues, budgetary hurdles and other potential minefields to resolve. Creating frameworks for how internal and external teams work together can add to the effectiveness of the project. The world of work will only continue to evolve to a much more dynamic model where resources – both internal and external to the firm – will come together to achieve a result, do so, and disband. If you haven’t prepared for this, it is time to do your homework, assess your organizational pitfalls, and begin. You can and should begin small with pilot projects, as these enable firms to become smart users of talent. The talent itself is attracted to smart companies, so it is a virtuous circle. In the Client of Choice study, being part of client environments where the work was valued and the freelancer was treated as an equal team member encouraged the workers to work with such clients. Smart attracts smarter.